Piwigo 2.9.5 is ready for new installations and updates. 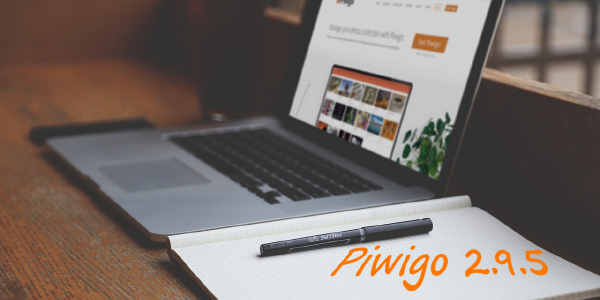 It's been a long time, nearly 9 months, since the last version of Piwigo was released. We are actively working on Piwigo 2.10 but for now, let's get some bugs fixed on Piwigo 2.9. We fixed a bug introduced in 2.9.4 on the user manager, made Piwigo compatible with PHP 7.3.3, fixed a compatibility issue with Piwigo Remote Sync, updated 17 languages and improved the speed on the album edition page. Thank you to bug reporters, pull-requesters like Peter Stimpel and our active translation team! Update successful. Thank you Piwigo team. Automatic Update worked fine. Again: Thank you Piwigo Team! I switched PHP to version 7.3.3 and so far so good. Updated both of my sites without issue ... nice work! I updated both my installations with no problems.